Mee Hoon is fried rice vermicilli. Mee Hoon is popular in Malaysia & Singapore. Singapore has it's own version of fried noodle which is equally famous. 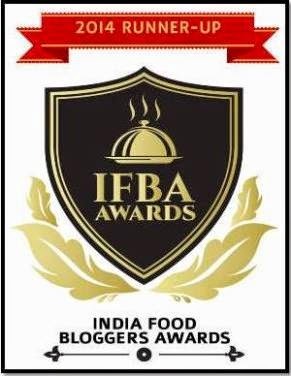 To simply this to 'desi' readers, Rice Vermiclli is our dearest 'akki shavige'. Akki Shavige is dressed up in various ways in Asia. 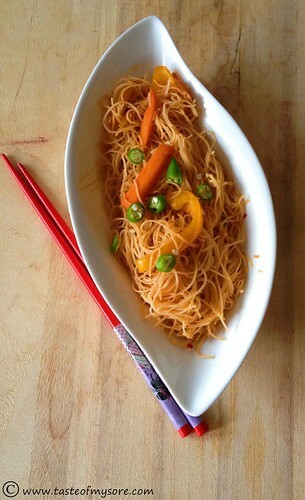 Thanks to this Malaysian Mummy who blogged the vegetarian version of Mee Hoon. 1. Soak Rice Vermicelli in very hot water for 5 to 7 minutes. See Notes. 2. Drain Vermicelli and cut them to trim their length. This is optional. 3. Cut all vegetables into thin strips. Cut garlic into small pieces. 4. Grind the items under the section with a little water to smooth paste and keep it ready. 5. Mix all the sauces in a bowl and keep it ready. 6. Heat oil in a wok*. Add chopped garlic. When garlic starts to brown, add in ground chilli paste. Stir well, fry for a min. 7. Add all vegetables and fry for 2-3 mins. Vegetables are kept little crisp in this preparation. If you are using bean sprouts, add them once other veggies are a bit soft. 8. Add in prepared sauce mixture and mix well. 9. Reduce the heat and add rice vermicelli and mix well. Use a pair of fork to mix the noodle and vegies. Once the mixture is warm, remove from stove. 10. Serve on individual plates topped with spring onions and chilli. 11. Enjoy when it is warm. 1. Use Rice Vermicelli available in Asian Stores. They are most suitable for this preparation. 2. Add Rice Vermicelli to boiling water and switch off the stove. Leave for 2-3mins and pour it in a colander to remove water. It takes less time than soaking. 3. Tofu can be used for this preparation. Cut Tofu into cubes, fry them in oil and keep it ready. Once veggies are fried, add tofu pieces and then add sauces. Im making this Lakshmi! Just what i wanted!!! Singaporean version of shavige :-), nice variation.